Minister in the Prime Minister’s Office (Minister of Unity and Social Wellbeing), P. Waytha Moorthy first came under media attention on the 18th of November. On this day, a video showing Waytha giving out statement about Malaysia tainting human rights went viral on social media. 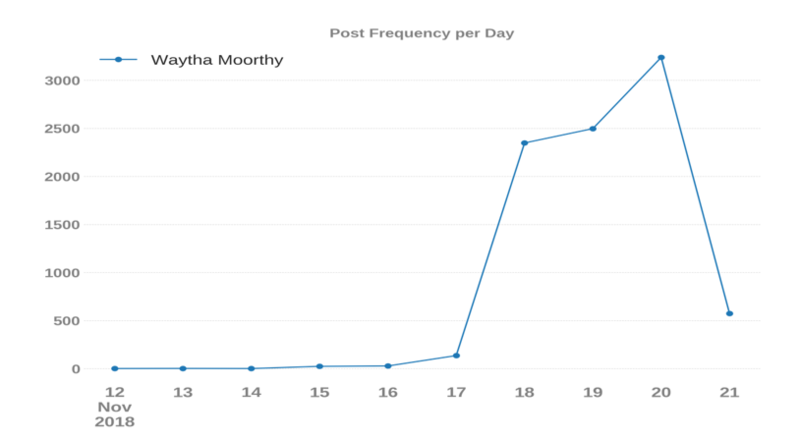 According to the graph above, posts revolving keyword “Waytha Moorthy” rose significantly on the 18th. This was the point whereby the video became the talk of the town in the Malaysia political scene. The next day, on the 19th, the Minister of Unity and Social Wellbeing presented on the ratification of The International Convention on The Elimination of All Forms of Racial Discrimination (ICERD) in Parliament. However, his presentation was abrupted as several opposition MPs called out Waytha as a “racist” due to his past video. On the 20th, keyword of Waytha hit its peak with more than 3000 posts. This day, the Minister had received major backlash, several members of the public requested him to resign. Plus, a petition was made calling for his resignation via change.org. 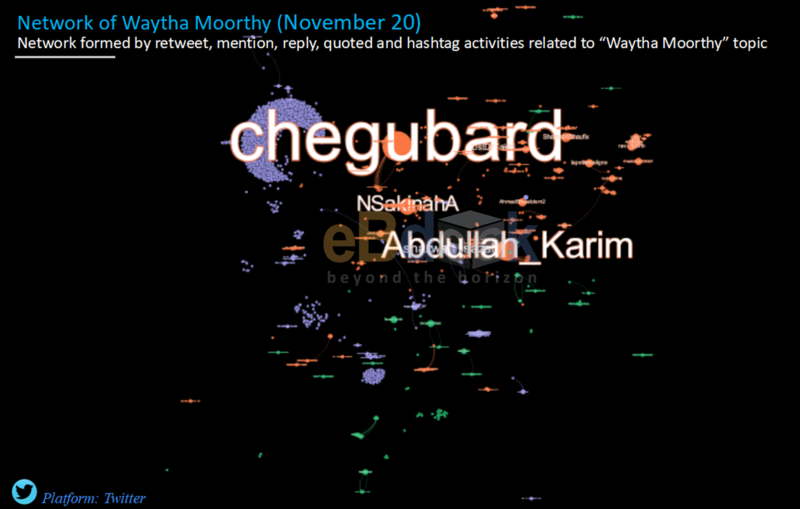 In Twitter, the sentiment on Waytha is negative. 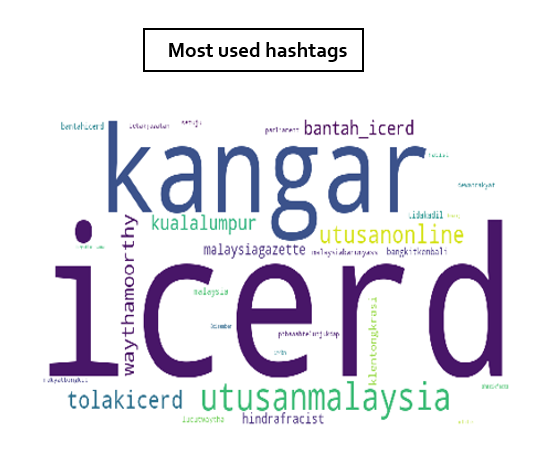 Strong words such as ‘pembohongan’, ‘dipaksa’ and ‘memburukkan’ were used on him, while for hashtags, there are #kangar in relation to Pemuda Umno Perlis police report against Waytha Moorthy’s viral video; #bantah_icerd, #icerd, and #hindrafracist. Chronologically, on the day the video went viral (18 November), netizens on Twitter had pointed their fingers towards Tun Mahathir for appointing Waytha as Minister. 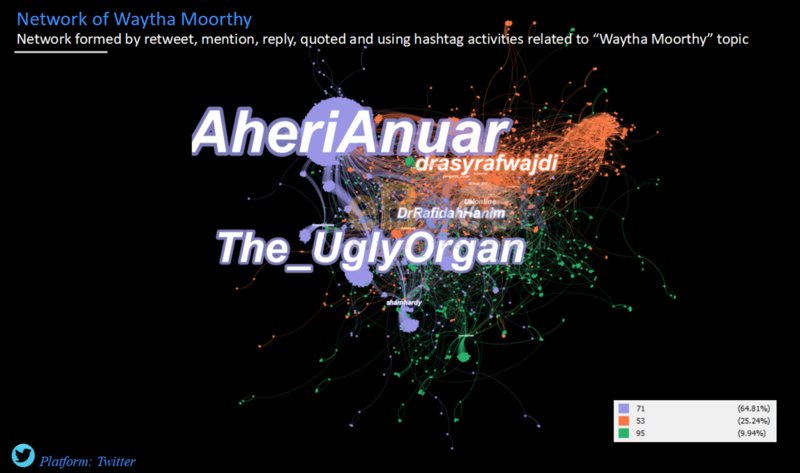 Based on the network above, @The_UglyOrgan and @DrRafidahHanim were the main influencers on Twitter that questioned Waytha Moorthy’s statement in the video saying that Hindus were forced to convert into Muslims in order to secure jobs and scholarships. On the 20th, the network is seen to expanded with more people attacking Waytha on Twitter. This is attributed to the latest issue on the Waytha as netizen questioned why the position in the minister’s office was only occupied by one race i.e. Indian. Those are @chegubard, @NSakinahA and @Abdullah_Karim. Overall, the network can be divided into three separate clusters. First, we have the purple cluster which is the largest cluster in the network with 4,120 tweets. This cluster is against Waytha Moorthy. It focuses on news of Waytha Moorthy tainting the name of Malaysia in an exclusive interview with a Dutch TV saying that Indians in Malaysia are discriminated and forced to convert to Islam if they want to work in government. 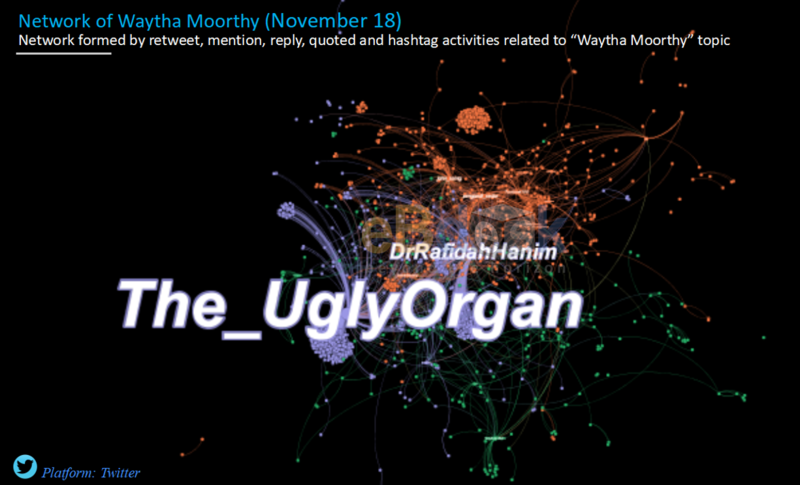 The influencers are @AheriAnuar, @The_UglyOrgan and @DrRafidahHanim. The second biggest is the orange cluster with 3,869 posts. This cluster talks about UMNO and Waytha Moorthy’s relation to the government. Many influencers from this cluster – @drasyrafwajdi, @UMOnline – are questioning Tun Mahathir’s move in appointing Waytha as Minister. Lastly, we have the green cluster with 739 tweets. This cluster primarily talks about ICERD in line with Waytha’s statement about Hindus being forced to convert in order to secure jobs and scholarships from the government in an allegedly 11-year old video that went viral recently. 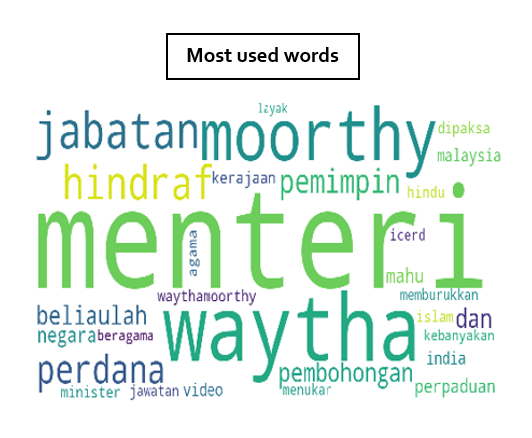 In conclusion, Waytha Moorthy was attacked vigorously on Twitter for his past video. From here, we can see that it will be difficult for him to address another racially sensitive topic in the future despite being the Minister of Unity and Social Wellbeing. Besides, this shows that one past statement can be his/her Achilles’ heel in the future.